redrumtvshow1998 from esther planas on Vimeo. 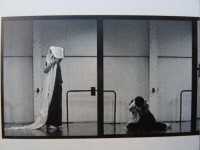 Short version of film performance/ dance Redrum 1998 Barcelona Music Esther Planas Luis Carbonell performing Esther Planas and Raquel Tapia. Redrum is the first film by Esther Planas, shoot in 1998 in Barcelona, was part of a DIY self curated show that took place in a deserted old derelict house . The topics of the show revolved around the psychic influence of watching too much Bad American TV (something we watch as subjugated subjects) in Spain about psycho-killers. It mixed it all up with a notion of a subconscious around reminiscences of the best films that she had experienced of that genre. A mix of Twin Peaks, The Shining and Don't Look Now. The narrative of this two supposed lost girls who perversely perform and re-enact a series of crimes committed by a female psycho killer. The ideas about hatred between women where explored in a text that was published as part of the multimedia show. 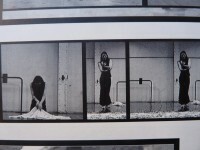 Planas performance was largely influenced by her then current dance kind of practice in Barcelona, with the input in improvisation. And the whole film breathes a surreal sense of humor about how much colonising our subconscious around what terrifies us is . My training as a Dancer has been very intensive over the years since 1970, but I also had experienced massive crisis about what was for me to be a Dancer and what was Dance, and my need of questioning take me to unexpected conclusions. I had stop dancing on various occasions and had come back to it every time to find new insight and techniques that surprised and inspired me. But I had to break free of what it felt like a too physical dynamic on my life as an artist and producer of some possible art. As actor, medium and agent, inside a context that could be film, installation, book or stage. 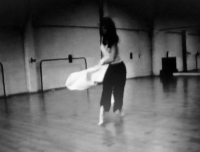 I am using and reviving (in a sort of hauntological exercise)pictures and films of ancient rehearses of a self long gone from 1995, when I used to search movements and positions that could be used for my work as a visual artist too. Always aiming at a cross over, at a feed of one on to the other, a mirror perhaps, or a step from one dimension on to an unknown yet place.